Shape-shifting, powerful heals, insta-cast heals, powerful CCs, hard to kill, what more could you want in a PvP healer? Patch 5.3 didn’t change much for you, other than a couple of tweaks and small buffs. Wild Mushroom: Bloom got a very nice buff. Otherwise 5.3 crushed PvP power and changed the Resilience rules. Basically you should find your Restoration Druid PvP to be a somewhat improved experience. If you’re looking for raiding info, see: Restoration Druid PvE. If you’re levening then see our Druid leving guide. If you’re coming back to Druids after a long absense check out our page on the Druid changes in Mists of Pandaria. DR = Diminishing returns. Each additional stun of a particular type (eg: all roots) will do less than the one before it. CC = Crowd Control – Sleeps, sheeps, stuns, roots, etc. Feline Swiftness – Not really useless, but there’s no burst and at times that’s what you really want. Wild charge – will cause you to move to an ally’s position. Occasionally useful, but D. Beast is more flexible. Natures Swifness – A free empowered cast every minute, what’s not to like? Lots of versaility. NS to heal, NS to Cyclone, etc. Renewal – An emergency heal every 2 min. You have better heals anyway, especially with NS. Cenarian Ward – buffed in 5.2, heals for a decent amount, but NS is much more versatile. Faerie swarm – Adds a snare for Faerie fire. Pretty situational against melee, fairly useless otherwise. Typhoon – Knockback and daze (which interrupts) every 20 seconds. Kite melee. Knock people off cliffs. Keep people away from you. Pretty killer talent. Soul of the forest – occasionally useful. 75% Haste for your next spell, after every Swiftmend, has its uses. Incarnation – 30 seconds of Tree Form on a 3 min cooldown. More healing and better defense for 30 seconds. Take it. Force of Nature – useless, unless you’re Role-Playing. This one really depends on the type of PvP that you’re doing. Disorienting Roar – Does not share DR with stuns. Nice for breaking group charges coming at you, including pet swarms. Immediately breaks on damage, so if your target already has DoTs on him, or is taking other damage, it won’t stick. Still, it’s pretty nice for BG groups. Ursol’s Vortex – Has it’s uses in BGs, not so hot in Arena. Mighty Bash – Stuns are nice, let’s face it. Even with a longish cooldown. Great for arena and 1 vs 1. Shares DR with other stuns, so if your group already has enough stuns then Disorienting Roar might be a better choice. Heart of the Wild – Nice, but that 6 min cooldown is a killer. Lots of options depending on your game and the exact situation. Glyph of Barksin – Generally useful. Reduces the chance opponents have to crit you. Glyph of Lifebloom – More efficiently transfer Lifebloom to a new target. Glyph of Cyclone – increases the range of a very useful ability. Glyph of Blooming – Increases the bloom heal, reduces duration, spell is no longer refreshed. Likely best when HoTs are going to be dispelled. Glyph of Rebirth – Nice for fights where you’re able to rez allies. Glyph of Dash – Reduces Dash CD. Glyph of Nature’s Grasp – Useful if melee is being annoying. Mostly just cosmetic, but there are a couple with functional changes. Glyph of Grace – Reduce falling damage in all forms. 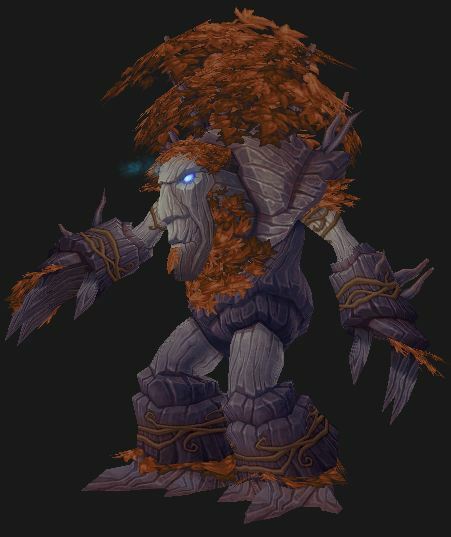 Glyph of Ttreant – Take on a Treant form, but no other benefits. Glyph of Aquatic Form – Faster swimming. Patch 5.3 cut the value of PvP Power by a third and the value of all PvP Power and Resilience Gems was cut in half. Useless: Hit and Expertise unless you’re playing offensively. Int is easily your #1 overall stat and you should pile up as much as possible. Reforge Mastery, and then Crit, into the best available stats. Spell Penetration is gone and is now “PvP Power.” This stat is a direct add to healing and damage Vs players. Point for point Int is better, but PvP Power gems have twice they valuer of Int gems, so they’re the ones you should pick. Resilience – Depends on how much you’re being focused. Given the massive burst in the game you might want to get more. The crafted gear set (for Resto Druids) only has two pieces with Spirit, but the Crit and Mastery on the other pieces can be reforged to Spirit. This would be a fine set for starting PvP at 90. Either take Leatherworking and make it or buy it from the Auction House or another leatherworker. Move up to the honor/conquest gear as soon as you can. You should try to match socket bonuses and you can use the hybrid gems to do that. All of these gems require item level 417+. If you’re not yet 90 you’ll have to level up or dig up similar gems. Give the big hit to PvP Power you should gem for Int. Since you have 65% resilience in your underwear you probably won’t feel a need to gem for it, though you can if you like. Meta: Burning Primal Diamond. Get the tyrannical gem if you have earned 27k Conquest Points. Other gems are listed if you want to experiment. Meta Courageous Primal Diamond: +324 Intellect and chance on beneficial spell to make your spells cost no mana for 4 sec. Requires a legendary gem quest. The Mists of Pandaria enchants are much nicer than their Cataclysm counterparts. Upgrade as soon as you can, but you will need a minimum item level of 372. Helm enchants are gone in Mists of Pandaria, all shoulder enchants come from the Inscription profession. There are no PvP Power enchants (except for the weapon,) the only Resilience enchants are the chest item and the weapon enchant. There is an Arena weapon enchant for your weapons that is quite nice, for a measly 1k Conquest points. Weapon Enchant Weapon – Glorious Tyranny: 600 PvP Power, 50% Disarm reduction, cost is 1,000 Conquest points. Enchant Weapon – Jade Spirit: Sometimes increases Int by 1650, might increase Spirit if mana is low. Shoulders Secret Crane Wing Inscription: – 520 Int and 100 Crit rating, Req. Inscription 550. Enchant Chest – Glorious Stats: +80 to all stats – with the 5.3 changes to Resilience this enchant is worth taking. Boots Enchant Boots – Pandaren’s Step: +140 Mastery, slight run speed increase. Videos, Forums, “How to” and Answers, Join here and get better. Two videos. The first shows some offensive techniques. The second shows various arena tips. Both videos are from Skill Capped. All of the professions provide some benefit for Druids of any spec, though clearly some are better than others. Even the gathering professions have some value (especially Herbalism,) though you might be better served by using those to build a larger gold stash. If you’re looking for the buffs then Blacksmithing might be the best choice since you can slot two gems and gems with secondary stats have twice the value of those with primary stats, 320 PvP Power Vs 160 Int, per gem, for example. It also gives you a bit more versatility with gem slotting, though you’ll most likely want to stick Int gems in those slots anyway. Your Leather bonus adds to any professional Int bonuses. Tailoring Cloak enchant sometimes adds 2k Int. Leatherworking Bracer enchant adds 500 int. Naturally you can make youir own gear while leveling. Enchanting Enchant both rings, for a total +320 Int gain. Inscription Shoulder enchant adds 520 Int and 100 crit. Alchemy More effect from your own potions. Adds 320 Int and an extra hour to your main flask. Also adds that hour and about 30% to the stats of any of your flasks and elixirs. Blacksmithing gives two extra gems slots. See the notes above. Herbalism Small heal, 2880 Haste for 20 seconds, and you will find life and mana spirits (in the M of P zones) that restore a nice amount of health and mana. All food buffs last one hour, but do not last through death. Alchemists get about 30% more effect and an extra hour from Flasks and Elixirs. Foods – None add PvP Power or Resilience. Flasks – Much better than the Elixirs. Flask of Falling Leaves: 1,000 Spirit for an hour. Potions – Keep a bunch on your bar. Now that you’re on the way to becoming a lean, mean, killing machine you should grab a full blown leveling guide for your blast to the top levels. Why? It will save you many days of in-game time and a good deal of frustration, even if you already know many or most of the quests. You’ll never again wonder about where to go, what to do, or where to find that thing you’re looking for. Pick your starting point and the guide automatically updates and advances as you complete quests, sets a waypoint arrow automatically, and includes all the important quest info. If you gain a few levels in the dungeons or in PvP, then come back to the guide, you’re still covered. It’ll figure out where you are and adjust accordingly, allowing you to ignore obsolete quests. Whether you’re brand new to WoW or decked head to toe in heirlooms Dugi will get you to the level cap faster than anything else out there. 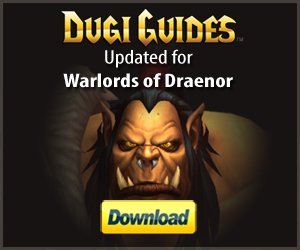 Grab your copy of Dugi’s Leveling Guide, here.